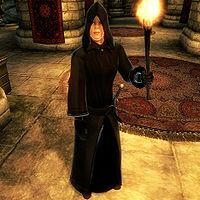 Arquen is an Altmer assassin and a Speaker of the Black Hand, the ruling council of the Dark Brotherhood. She first appears at the culmination of the quest Following a Lead. Although she is not the Listener, she leads the player and other Speakers of the Dark Brotherhood during the subsequent quest Honor Thy Mother. After the completion of the Dark Brotherhood quest-line, she will reside in the Dark Brotherhood Sanctuary in Cheydinhal, where she becomes the main contact for the player. She wears Black Hand robes with a matching hood and a pair of doeskin shoes. She is armed with an iron dagger. When you arrive at Applewatch with the diary in hand, expecting to see Lucien Lachance, you will instead be met by Arquen and the macabre sight of Lucien’s tormented corpse dangling from the ceiling. Arquen will fill you in on what she believes is the truth about the traitor: "Silencer! At last you've arrived! Fear not, for the crisis that has threatened the Dark Brotherhood has finally come to an end. I am Arquen, Speaker for the Black Hand. As you can see, we have dealt with the betrayer, Lucien Lachance! No longer will you serve as his puppet! It seems Lachance wanted revenge against the Dark Brotherhood for some reason, and used you to do his dirty work. But now, we can begin anew! I bestow upon you the title of Speaker. You will take Lucien Lachance's place on the Black Hand! Welcome! As you know, the Black Hand is now in a state of disarray. Lachance ordered you to kill us off! We five, including you, are now all that remain. Even worse, you killed the Listener! The Black Hand without a Listener is like a hand with no thumb. Even the Listener's successor is dead! So, we have no choice but to invoke an ancient ritual. We must wake the Night Mother from her slumber, and seek her guidance! Between the hours of midnight and 3:00 AM, ask me about the Night Mother, and we will away to our Lady's home. Only then will the ritual begin." When asked about Lucien Lachance, she will say: "When we confronted Lachance he tried to defend himself, tried to declare his innocence! But we would not hear his treacherous lies! As you can see, he was no match for the combined power of the Black Hand, even weakened as we are." If you ask her about rumors, she will neglect you with: "This is no time for gossip mongering. A dark destiny awaits us." When you exit conversation, Arquen will finish with: "May the Night Mother hold you in her cold embrace." She will then wait for you to approach her again, without ever eating or sleeping. Once you approach her, she will expectantly say: "Dear Speaker, when darkness shrouds the Empire, we can travel to the resting place of the Night Mother, and begin the ritual of awakening." If you ask her about the Night Mother during the day, she will repeat her orders: "You must understand our need for darkness and secrecy? Speak to me only between the hours of midnight and 3:00 AM, and we will be off." If asked about the Night Mother between midnight and 3am, she will instead ask you a question: "The Night Mother must be awakened, so that we may seek her guidance. Are you ready to travel now to her resting place?" If you say ‘no’ she will give you some extra time to prepare: "All right, but don't tarry too long. Until we receive the Night Mother's guidance, the Dark Brotherhood will remain in disarray." When you accept, she say: "Very good! And so it begins, the Black Hand's journey into a darkness few can imagine. Let us be off! The Night Mother awaits!" "Unholy Matron, we of the Black Hand beseech you!" What is the meaning of this desecration? Who has disturbed my ancient slumber? Dearest Night Mother! Most Unholy Maiden! Please, we beg your mercy in this, our time of need! The Black Hand seeks your guidance! Ah, yes, I have been expecting you. The Listener now kneels by Sithis, as does his successor. There is a traitor amongst you. The traitor is dead, dear Mother. We have come now to ask your blessing. Anoint one of us your Listener, so we can restore the Black Hand! Foolish little girl. Lucien Lachance served Sithis til his dying breath. The Black Hand remains tainted by betrayal. Restoration is impossible. Finally, Mathieu Bellamont draws his dagger and kills every Black Hand member but Arquen, who will draw her own dagger and fight back with the words: "What treachery? The traitor still lives! It is Mathieu Bellamont! Do not let him harm the Night Mother! Kill him!" After you have slain Bellamont, Arquen will comment: "Now is not the time for us to speak! We must hear the words of the Night Mother! She will guide us in this hour of despair!" After being promoted to Listener by the Night Mother, you are free to loot the crypt. If you approach Arquen at this point she will simply say: "The Night Mother wishes for you to take some time to consider your new position. We will speak when we are back in the Sanctuary." As soon as you accept the Night Mother’s proposal, both you and Arquen will be sent to the empty Sanctuary in Cheydinhal. With the traitor revealed and disposed of, the Dark Brotherhood quest line has come to an end; Arquen, however, will have new tasks for you: "Honored Listener! I offer myself as your humble servant and guide. Please, allow me to mentor you in your new role. Here is what I believe we should do next. I will stay here and attempt to reestablish this Sanctuary. I will begin recruiting new members. You must fulfill your new duties. The statue in Bravil serves as a conduit between the Night Mother and the Listener. Once a week, you must visit the statue. Talk to it. You will be presented with a list of names and locations. These are people who have prayed to the Night Mother! They request a visit from a Speaker, to arrange someone's assassination. 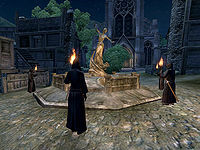 All you need to do is visit the statue once a week, get the list of names and locations, and pass it on to me here in the Sanctuary. Do this, and I will give you your share of the Sanctuary's weekly earnings. There is so much work to be done. So much work..." When you approach her again, she will give you the first assignment: "Greetings, most honorable Listener. The time has come for you to hear the whispers of death. Go to Bravil, and listen to the Night Mother." Arquen will then wait for you in the Sanctuary, still not sleeping or eating. When you return from Bravil, she will hand you a reward and comment: "So, the Night Mother has spoken! I will make sure this information reaches the appropriate family members. Ah yes, here are your weekly earnings. I will see you next week, most honorable Listener." When asked about Sithis Arquen will explain: "Sithis has blessed us with you, dear Listener. He is our Dread Father, and his wisdom and terrible fury know no bounds." She'll finish the conversation with the words: "Under your leadership, the Black Hand will reign eternal!" If you ask one of the new Dark Brotherhood Murderers about rumors they will ask a macabre question: "I... I heard what they did to Lucien Lachance... Is it true that Arquen feasted on his entrails?" Arquen starts the game with the Dark Brotherhood rank of Murderer, as listed in the summary box. During the quest Honor Thy Mother, she is promoted to the rank of Assassin; at the end of the quest she is promoted to the rank of Speaker. The eighth dead drop–the one you get in Anvil after killing Ungolim–orders you to kill her. Although she is designated as being permanently essential, her health gets a boost from 145 to 2000 during the Honor Thy Mother quest. This incredible amount of health is probably given to her so she will not be rendered 'unconscious' during Mathieu Bellamont's assault. Esta página foi modificada pela última vez à(s) 21h58min de 23 de janeiro de 2015.